Explanation: Separated by about 14 degrees (28 Full Moons) in planet Earth's sky, spiral galaxies M31 at left, and M33 are both large members of the Local Group, along with our own Milky Way galaxy. This narrow- and wide-angle, multi-camera composite finds details of spiral structure in both, while the massive neighbouring galaxies seem to be balanced in starry fields either side of bright Mirach, beta star in the constellation Andromeda. Mirach is just 200 light-years from the Sun. But M31, the Andromeda Galaxy, is really 2.5 million light-years distant and M33, the Triangulum Galaxy, is also about 3 million light years away. 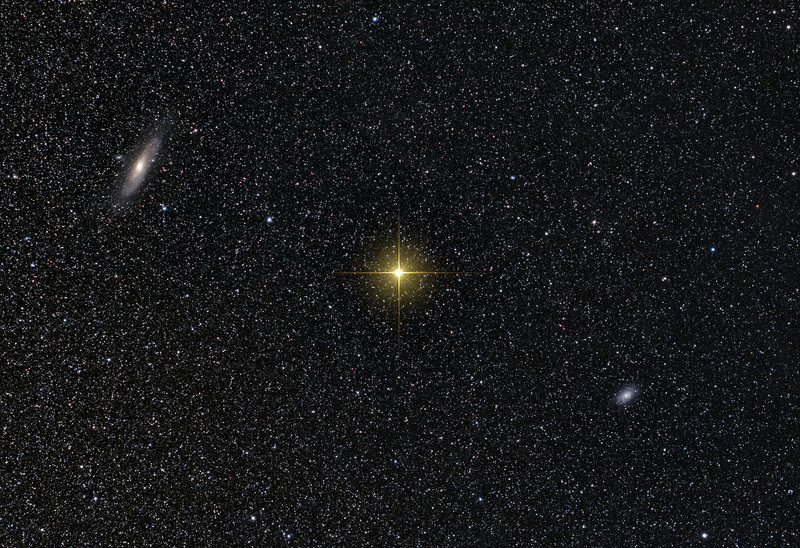 Although they look far apart, M31 and M33 are engaged in a gravitational struggle. In fact, radio astronomers have found indications of a bridge of neutral hydrogen gas that could connect the two, evidence of a closer encounter in the past. Based on measurements, gravitational simulations currently predict that the Milky Way, M31, and M33 will all undergo mutual close encounters and potentially mergers, billions of years in the future.